For most of us, our favorite teacher was someone we felt really cared about or challenged us; someone who recognized us and reached out to us. I was facing another difficult class of 29 8th graders from a variety of backgrounds. Four of them had been expelled from other schools. Two of them had older brothers who were involved in gang activity. Seventeen came from single-parent homes. Several of them were on welfare. One had a father in prison. The first day, I had to go over the rules in the handbook. Those who were following along were laughing and making snide remarks—too softly for me to hear exactly what they were saying. I passed out books and collected emergency cards, and finally the day was over. The second day, I decided to take the students for a "book walk" through the social studies text. I had read recently that pre-exposure to the material would help students feel more comfortable later when we cover it. Two students started a verbal battle over some of the content. Fifteen others joined in. My room was next to the principal's office, and I feared the ruckus could be overheard. My heart was racing. I looked at the clock, praying it was time for the bell. No such luck. I wondered how teachers on television and in movies could always be "saved by the bell." I opened my desk drawer and pulled out a whistle. One quick blow and the kids quieted down. Some were surprised, others angry, but quiet. I gave them a quick assignment: to draw a picture of any historical event they wanted. I sat and waited for the class to end. The bell rang, and I beat the students out the door. On my way out, I literally ran into one of my colleagues. I looked him in the eye and said, "I cannot teach these kids!" He looked back at me and responded, "Sure you can—but first, you have to get their attention. If you can't do that, you can get a different job." I was taken aback, but I knew he was right. I started thinking about how I was able to reach students in the other classes I'd taught. I knew the whistle worked only because it was novel. Should I come up with other novel ideas? What else might be valuable? To reach my students, I would definitely need to get their attention. I would also need to forge emotional connections and good working relationships with them. I would need to understand their learning preferences, and I would need to make the material relevant to their lives. We are bombarded with sensory stimuli throughout the day: 2,000 bits of information are allowed in by the brain's filtering system every second (Willis, 2009/2010). According to neuroscientist Michael Gazzaniga (1999), our brain retains only about 1 percent of that information. How do we help our students hold onto even the sensory information, let alone all the semantic information they need to remember? According to Shaun Kerry (2002) of the American Board of Psychiatry and Neurology, whether certain events or information are retained in memory is "dependent upon an individual's love for the subject matter and its dramatic, emotional, auditory, and visual impact." I used to always consider "attention" only in the context of attention spans. How long could I keep students' attention before their minds drifted away? The formula I'd learned was that attention spans are equal to students' ages in minutes. So, for example, a 7-year-old student has a seven-minute attention span. It is time for Writer's Workshop. The 3rd graders are scattered throughout the room. There is a low buzz of conversation as some of the students discuss their writing with others. The teacher is conferencing with J.D. Katie sits quietly at a desk, rereading her short essay on her favorite book. As she reads, she pauses to draw a picture depicting an episode in the book. Jamie approaches Katie's desk and asks to borrow a blue marker. Katie stops reading and hands the marker to her. Jamie glances at the picture Katie is drawing and asks her several questions about the book. Katie colors in the house she has drawn as she describes the characters and the scene. Interrupting the conversation, Angelo says he needs to get a book out of the desk at which Katie is seated. He excuses himself and starts looking for the book. Katie must stand now to color while she carries on her account to Jamie. Katie keeps coloring with her right hand while using her left hand to grab the book she has spotted for Angelo, who thanks her and goes back to the table where students are peer editing. Jamie's interest is piqued by Katie's account of the story, so she asks for the name of the book author. Katie has loaned the book to Tiffany, who sits across the aisle, so the girls ask Tiffany who the author is, maintaining their dialogue as they await a response. Katie is listening to Jamie's comment about the book as she admires the picture she drew. She is also listening for Tiffany's voice to tell her the author's name. Katie picks up a green marker and draws a large tree next to the house as Tiffany reads the author's name and Jamie returns to her seat. Brain research suggests that there are four essential criteria for gaining attention: need, novelty, meaning, and emotion (Tate, 2016). Attention itself, according to Andreason (2004), is the cognitive process that allows Katie to ignore irrelevant stimuli (extraneous student conversations), notice important stimuli (her essay, her picture, Jamie's comments), and shift from one stimulus to another (from talking to Jamie to drawing the picture, from interacting with Angelo to interacting with Jamie and Tiffany). She was balancing visual information in the picture. She attends to auditory information as she listens to Jamie and for Tiffany. The tactile information she is dealing with includes drawing her picture, grabbing the book for Angelo, and giving Jamie the marker. Sustained attention involves focusing for a long period of time. Creating lesson plans or assessments requires this type of attention. Directed attention occurs when we consciously select a particular stimulus from all that bombards us. This is the attention we give students who disrupt the class, for example. Selective attention involves focusing on one particular stimulus for a personal or sensible reason. For instance, a student may select to listen to a whisper from another student rather than to the lecture being given. Divided attention occurs as we rapidly shift focus from one thing to another. Our students are dealing with divided attention when they do their homework in front of the television. Focused attention is directed to a particular aspect of some stimulus. When we ask students to focus on the answer to an essential question as they research on the internet, we are asking them to engage in this kind of attention. Attention is necessary for thinking. The brain scans the environment, sifting through sensory messages to find something to pay attention to. The brain is always attending; our students just may not be attending to what we desire. Attention requires three elements: arousal, orientation, and focus (McNeil, 2009). The reticular activating system in our brains (see Appendix A) controls arousal levels through the amount of neurotransmission it emits. Stimulation of the frontal lobes by norepinephrine and dopamine changes the brain's electrical activity and causes us to be alert, at which point the parietal lobe disengages from the current stimulus, and we are oriented to the new stimulus. The thalamus then controls the situation and allows us to focus as it carries the new information to the frontal lobes. The thalamus has the power to inhibit other sensory stimulation to aid us. The anterior cingulate allows us to maintain attention (McNeil, 2009). The hippocampus is a major player in the attention process. Because of its access to so many memories, if the reticular activating system reacts to some sensory stimulation, the hippocampus can compare it to old experiences and determine its novelty (Ratey, 2008). Noah is playing on his tablet. It is seven o'clock, but he is too engrossed in his game to realize that time is passing quickly. His tablet suddenly goes dead. Noah had received a warning that the battery was low, but he wouldn't stop the game to find his charger. With the battery completely dead, he searches through his room to find the cord and plugs it in. While waiting for enough of a charge to continue his game, Noah glances at the clock. He can't believe time slipped by so quickly. Noah's reticular activating system arouses him. He has a load of homework to complete and obviously didn't realize how time flies! Noah looks at his stack of books. He begins to prioritize. "Let's see. I might be able to get my English done on the bus tomorrow. I have to finish my math now because I might need Mom's help. Then I'd better practice those words for my spelling test." Noah's frontal lobes are now orienting him to his homework. They are helping him plan and prioritize. He "needs" his mom to help with math, which is why that subject gets his attention. Noah pulls his math book from the pile, opens his notebook, and is completely focused on his work. He doesn't hear his mom open the door to look in on him. Noah's thalamus has filtered out sensory stimuli that will not aid him in his current focus of attention, his math homework. Mental Note: Without awareness of incoming information, explicit learning cannot occur. Jeremy and Joe are good friends. They've attended school together since kindergarten. Their mothers belong to the same book club, and their fathers often golf together. On this sunny Saturday afternoon, Jeremy and Joe are going to the batting cages. Baseball season is right around the corner, and they're hoping to move from the junior varsity team to varsity. They are just gathering their bats when Joe's dad approaches. "Hey, guys, how about coming to the course with us this afternoon? We could use some good caddies," he asks. Jeremy's face immediately lights up. "That sounds like fun. I could use some pointers on my golf game, and it's really a great day to be out in the sunshine! Don't you think so, Joe? We can go to the cages afterward. You've been saying you want to try out for the golf team. This could be a great opportunity." Joe, however, is not convinced. When his dad looks at him for a reply and sees the negative look on his face, he sighs and says, "OK, Joe, we'll pay you for your trouble." Joe nods his head. "OK, but it has to be more than 10 bucks. That's what you gave me last time—I won't do it for that." Two similar boys with similar interests, yet quite different responses: Whereas Joe required extrinsic motivation—money—to caddy, Jeremy was happy to do it for intrinsic reasons. For Jeremy, the prospect of caddying includes at least three of the four criteria for capturing attention suggested by the research: need (he "could use some pointers"), meaning (it's a way to bond with his friend and their dads in fine weather), and emotion (he takes pleasure out of the game). Merriam-Webster (2003) defines motive as "something (as a need or desire) that causes a person to act" (p. 759). When I ask my students about their needs, they usually oblige with a very long list that nevertheless excludes the content I teach them! Students too often do not see reading, math, history, science, or writing as a necessity. It's up to us as teachers to prove to them that the topics are necessary and even desirable to learn. Intrinsic motivation comes from within—it is a desire or need that the brain determines is pleasurable or important. When we are intrinsically motivated, neurotransmitters such as dopamine and norepinephrine are released in our brains (Burns, 2012). These chemicals provide the "get up and go" necessary for us to accomplish our goals. The same neurotransmitters are released anew when our goal is attained. Dopamine, the pleasure chemical, makes us want to achieve goals again to repeat the good feeling. Extrinsic motivation, by contrast, is associated with rewards and punishment. Some researchers, such as Alfie Kohn (1993), believe that extrinsic motivators can alter the brain to shift a goal from attaining the nominal objective to either attaining some tangible reward or avoiding a punishment. If dopamine is released when students receive rewards, their brains may become trained to associate the resulting good feeling with the rewards rather than the accomplishments. In our sample scenario, Jeremy is seeking his feel-good neurotransmitters from the experience and the learning, whereas Joe seeks his from the payment. Many researchers believe that the external reward must get larger to receive the same level of pleasure or excitement over time. This is why Joe won't settle for $10 anymore. Mental Note: Attention and motivation require need, novelty, meaning, or emotion. Physiological needs. These consist of basic survival requirements. Food, water, shelter, and clothing fall into this category. If a student is hungry, that hunger will remain the student's first priority until it is satisfied. Attention will always be focused on unmet needs. Safety needs. Security, freedom from threat, and predictability are all important to the brain's need for safety. If physiological needs are met, the brain focuses on the safety needs. Once these are met, it turns itself toward the next level. If our students feel safe and unthreatened in our classrooms, their levels of focus and attention are not impeded. Belonging and love. These two needs taken together are a primary motivator for the brain. People seek to overcome loneliness when their physical needs have been met and they feel safe. Relationships with friends, spouses, and children provide a sense of belonging. Students who have good relationships with their teachers and other students have neurotransmitters such as serotonin and dopamine released in their brains to make them feel good and feel motivated. Esteem needs. Self-respect, achievement and success, and a good reputation fall into this category. Feeling valuable in the classroom helps our students focus. Especially when they feel valuable to the teacher, they put forth more effort. Self-actualization. This level is defined as becoming what the individual is most suited for. Attaining this highest level on the hierarchy is an incredible accomplishment that we want for all of our students. They must first know that they are safe, that they belong and are valued, and that they can respect themselves as others respect them. Neuroscientist Matthew Lieberman (2013) believes that Maslow had it wrong! Because we are born totally dependent on others for food, shelter, and so on, Lieberman has inverted Maslow's hierarchy somewhat (see Figure 1.2). In his view, social ostracism can be just as devastating as physical pain, so it follows that the strongest need is for social acceptance. In our students' world, belonging to a social group can take precedence over hunger and other basic needs. For example, my 7th grader Kakisha almost wet her pants once because she would not go to the restroom until the girls divided themselves into teams for volleyball, afraid that she wouldn't get chosen if she weren't around. To reach our students, we must be aware of their needs and make every effort to meet them so they will be able to attend to the information we want them to learn and remember. In his book Choice Theory, William Glasser (1999) defines five equally important needs: survival, belonging and love, power, freedom, and fun. On the cover of his book is a statement that epitomizes this theory: "Choosing the life you want and staying close to the people you need." From his theory, we can conclude that offering choices to our students (that is, responding to their needs for power and freedom) may also make them feel good about what they are doing and therefore make them more motivated and attentive. Belonging and love encompass the latter part of the statement. Students need to feel close to others and know that they can rely on their teachers and their peers. According to Brophy (1987), student motivation is an acquired competence developed "through general experience, but it is stimulated through modeling, communication of expectations, and direct instruction or socialization by significant others" (p. 41). Therefore, the classroom environment—how the teacher affects the socialization process, what the expectations are and how they are communicated, and the modeling component—can significantly influence student motivation and attention. Mental Note: The brain cannot focus on learning if basic needs are not met; students may define basic needs differently than we do. Vanessa is in the school storeroom gathering material for an art project. Art is not her favorite subject, and her selection shows little creative effort. She has collected markers, paper, and rulers. Nothing is sparking ideas for the assignment called "My Ideal Spot." Vanessa doesn't want to spend a lot of time on this project because she has two other assignments to complete. As she wanders up one aisle and down another, she spots Jessie. Jessie is a student who does it all. She takes ballet and piano, writes award-winning essays, and is very artistic. She loves projects like this. Jessie is bright and lets others know it. Vanessa notices Jessie's acquisitions. She has filled her arms with glue, glitter, cotton, clay, and oil paint. Vanessa turns to avoid Jessie, who will undoubtedly brag about her project, but it's too late. Jessie walks up to Vanessa and looks at her meager collection of items. She smiles and pushes her heavy load toward Vanessa. She glances down at the markers and asks, "You just getting started?" Vanessa feels totally inadequate and replies, "Yes, I just got here and grabbed some of the usuals. Now I'm backtracking to get the good stuff." "So, what's your project going to be?" Jessie asks. Vanessa suspects that she is just asking so she can outdo her with a fabulous project idea. Vanessa tries to think quickly and responds with, "Oh, my ideal spot is a secret place that I share with my friends. I have to check with them and make sure it's OK to use it for this project." Vanessa thinks that should quiet Jessie down. After all, she probably doesn't have a spot she shares with friends! "Well, my ideal spot is in Hawaii," Jessie says. "My family goes there every year for two weeks. There are wonderful beaches, and there's an awesome volcano. When I told the art teacher about my idea, he was so excited to see it." Jessie rambles on, mentioning plants and places that Vanessa has never heard of. Her mind wanders until she picks up on Jessie's last comment: "Vanessa, if you ever want to learn how to create a fabulous project, let me know." Vanessa is overcome with anger and embarrassment. She opens her mouth to give Jessie a witty reply, but nothing comes out! Her brain just can't seem to grasp any smart-aleck remarks. She smiles at Jessie with clenched teeth and walks away. Vanessa is seething. How dare Jessie make a remark like that? "I can do my own art project," she thinks. "I certainly don't need her help. I should have just let her have it, but I'm too much of a lady for that. Why couldn't I think of a comeback? I'm the comeback queen. I always have a comment for everyone." Vanessa's emotions have her tongue-tied. Goleman (2013) calls this an emotional "hijacking." Higher-level thinking doesn't take place when this phenomenon occurs. Vanessa is stuck in the emotional center of her brain and can't access the creative center. A few hours later, she comes up with several responses for Jessie and even thinks about calling her to share them! Emotions have a strong influence on learning (Small, 2003). If students are anxious, depressed, or even angry, they do not receive information in an efficient way. The brain is captivated by the emotion and turns attention to it. When these emotions capture the brain's attention, working memory is flooded and cannot work on the task at hand. Most researchers refer to the six universal emotions: happiness, sadness, fear, anger, surprise, and disgust. These are primary emotions that are found and recognized in all humans all over the world. Secondary emotions are socially oriented; jealousy, guilt, and embarrassment are a few. Finally, some emotions, like tension and well-being, are what Feldman (2007) calls "background emotions." Emotions are produced in subcortical regions of the brain; they are part of a set of structures that represent body states. Involuntarily engaged, without conscious knowledge, they affect both the brain and the body. Emotions and emotional states are patterns of response that lead to behavior. These emotions and behaviors can occur when people perceive information through the senses or when they conjure up certain memories. The 2015 animated film Inside Out portrays quite accurately five core emotions: joy, sadness, fear, anger, and disgust. In the film, the use of these emotions under both difficult and happy times can be easily understood (Desautels, 2016). The emotions Vanessa feels when encountering Jessie represent sensory information and can be rekindled when she thinks of the situation later on. When Vanessa next runs into Jessie, those same emotions may resurface and affect her behavior. The amygdala is the major player in emotions and their memories. Because the amygdala modulates both explicit and implicit memory as it accesses incoming information, we remember emotionally charged events better than boring or neutral ones (Bloom, Beal, & Kupfer, 2003). According to LeDoux (2002), "Attention, perception, memory, decision making, and the conscious concomitants of each are all swayed in emotional states … emotional arousal organizes and coordinates brain activity" (p. 225). In The Seven Sins of Memory (2001), Schacter notes that "emotionally charged incidents are better remembered than nonemotional events. The emotional boost begins at the moment that a memory is born, when attention and elaboration strongly influence whether an experience will be subsequently remembered or forgotten" (p. 163). Stephen Hamann of Emory University uses magnetic resonance imaging (MRI) to gauge emotional responses to words and pictures (Hamann, Ely, Grafton, & Kilts, 1999). The imaging shows the activation of the amygdala when individuals respond to an emotional sight. "When the amygdala detects emotion, it essentially boosts activity in areas of the brain that form memories," says Hamann. 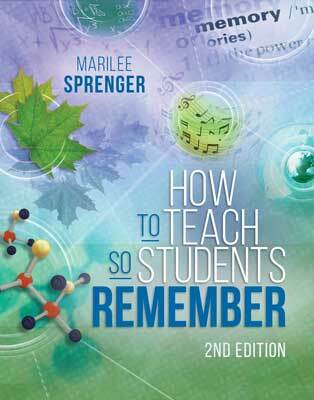 "And that's how it makes a stronger memory and a more vivid memory" (p. 292). Subjects in Hamann's experiments remember twice as many emotional words as neutral ones. Because emotions are so powerful, incorporating emotion into our teaching is an excellent way to reach our students. If emotion organizes brain activity, and attention and perception are swayed by emotional states, then our everyday experiences in school will become more memorable if we use emotions to reach our students. Be sure that your presentation is exciting. Excitatory neurotransmitters are released when we feel excited. Norepinephrine starts a cascade of chemical responses that increase the intensity of the experience and the perception of it. Greet students at the beginning of class and say something positive to them (Allday et al., 2011). Emotions are contagious (Guillory, Hancock, & Kramer, 2011), so act excited yourself. What excites you about what you're teaching? Dress in a costume that will garner students' attention—whether approvingly or not! Begin the lesson with a story. This can be a personal story that you somehow relate to the topic at hand, or it can be a secondhand story with connections to the topic. The brain loves stories, as it is a natural way for it to organize information (Willingham, 2004). Begin the class by asking students to make a choice. If the issue you will be studying has two sides, divide the room in half and have students choose a side as they enter. Put up two posters, one on each side of the room, to indicate what each side believes. Mental Note: Emotions take precedence over all other brain processes. As Marzano, Pickering, Norford, Paynter, and Gaddy (2001) put it, "We often see what we expect to see" (p. 279). In this way, advance organizers are powerful instruments for focusing our students' attention. These organizers come in many packages. For instance, an advance organizer could be an oral presentation of the subject matter and how it relates to prior knowledge. The most effective graphic organizers focus students by providing them with a framework for learning to which they must adhere. My favorite organizer is the agree/disagree chart (Burke, 2009; see Figure 1.3). Such a chart is composed of statements that can be presented orally or in writing. I prefer a chart with statements on them and a place to check "agree" or "disagree." The agree/disagree statements will evoke emotions in most students. They also help them understand the concepts that are being shared. 1. Younger people remember more than older people. 2. Age has nothing to do with memory. 3. Memory is stored in one area of the brain. 4. You only have enough immediate memory for a phone number. 5. Females have better memories than males. 6. You never forget how to ride a bike. 7. It is easier to forget than to remember. 8. Smells trigger certain memories. Advance organizers call on prior knowledge. If the students have no previous experience with the subject, you can ask them to make an attempt to agree or disagree. When the unit is nearly finished, I give my students another opportunity to read the statements and agree or disagree. They then compare the original chart with the most recent one. Some students are amazed at what they have learned, while others pat themselves on the back for what they already knew. Most graphic organizers can be used as advance organizers (see Appendix B for several examples). Venn diagrams help students see similarities and differences. Mind mapping is a helpful way to organize new material. Recent research has shown it is especially helpful for dyslexic students (Verhoeven & Boersen, 2015). KWHLU charts help students pay attention: K for what you already know, W for what you want to know, H for how you want to learn it, L for what you've learned, and U for how you will use what you've learned in your world. Hierarchy diagrams may be useful for classification purposes. T-charts can be used to organize many content areas. Sequencing charts are great for stories or history time frames. Mental Note: Show the brain what to focus on. Dividing students into learning "styles" or "preferences" may be helpful for some teachers. When I started on the brain-compatible path to teaching years ago, part of my training was based on the concept that students have preferred modalities of learning. This knowledge changed the way I taught and made my classrooms more "neuro-appropriate." As I saw the effect of continually changing the way in which I presented material and the memory extensions as a result, I always kept in mind three little words: visual, auditory, and kinesthetic. Today, much research shows that most students are primarily visual in the way they take in information (Medina, 2014). It's easy to see why in our ever-increasingly visual world. We don't have conference calls anymore; instead, we Skype or FaceTime. Students can read textbooks, but it's so much more enjoyable, entertaining, and memorable to learn by watching or listening to the cast album of Hamilton: An American Musical. If we keep in mind that a multisensory approach is going to be much more engaging, we can bypass some of the older ideas about learners. If we remind ourselves that a picture is "worth a thousand words" and use plenty of different kinds of representations, we can keep our classrooms more interesting. And if we never, ever, forget that movement helps the brain in a multitude of ways and keeps our classrooms interesting, we can make a huge difference in the lives of many of our students. Consider the following example. Students enter my 9th grade classroom on an oppressively warm day. The windows are open, but little air is circulating. It is time to begin a unit on the Civil War. This is not a favorite topic of mine, perhaps because my own history teacher did a mediocre job of presenting it. With this heat, I am not in the mood to teach at all, let alone approach a challenging topic. I might start the lesson by saying to the kids, "I know you're hot. I am, too. This may be tough, but it's time we started studying the Civil War. Does anyone know anything about that war?" Alternatively, I might start by playing some appropriate music—maybe "I Wish I Was in Dixie"—and handing students cups of water as they enter the room. When the starting bell rings, I could turn the music off and say, "Walk around the room and look at the Civil War posters and paraphernalia. As warm as we are today, I want you to realize that the soldiers who fought in this war were wearing heavy uniforms and were out in the sun continuously. How many of you have seen Gone with the Wind? Do you remember that there was a lot of bloodshed? I hope that blood doesn't bother you all. It really was a bloody war!" The second approach to opening the class is more of an attention-getter for several reasons. First, some emotions are evoked with the use of music and the mention of blood. Second, the approach is multisensory: As soon as the students enter the room, they begin moving, listening, and looking. Finally, I relate their present experience of being hot and uncomfortable directly to the individuals we are about to study. I give them water to fulfill a physiological need, as well as to let them know that I understand how they are feeling and that we are in this together. Mental Note: Although individual learning styles are not truly representative of our students' needs today, teaching in a multisensory fashion can help close the achievement gap. The feeling of togetherness that the second scenario above conveys is only accessible if I have first taken the time to set up relationships with each of my students. This is key to learning in any situation and with people of any age. Our relationships offer a framework for understanding our progress and appreciating the usefulness of what we're learning (Goleman, 2013). Four emotional intelligence domains can be applied to relationship building in any environment: self-awareness, self-management, social awareness, and relationship management. Self-awareness and self-management deal with personal skills. Recognizing our own emotions is critical to attaining the other competencies. If our students know how they feel, they are then able, with guidance, to learn how to manage their emotions. We hope that our students come to school with these abilities, but sometimes it behooves us to add them to our repertoire, as it will make teaching and learning much easier. By contrast, social awareness and relationship management are social skills. Being able to sense others' emotions, understand their perspectives, and show concern can foster powerful teacher–student and student–student relationships in the classroom. Relationship management includes managing conflict, influencing others, and cultivating relationships. The passions that any of us have for our work may come from pure emotion like excitement, from the satisfaction that we get from the learning, or from the joy of working with others. Any of these motivators activate the left prefrontal cortex, which receives many of those "feel good" neurotransmitters. Simultaneously, the prefrontal circuits quiet feelings of frustration that might interfere with the learning (Goleman, 2013). Building relationships with students requires finding common ground with them. The more they feel they are like you or like each other, the more comfortable they are developing relationships that will enhance learning. One method I like to use I borrowed from a 5th grade teacher. It's a get-to-know-each-other activity with a twist (see Figure 1.4). Students receive a sheet divided into boxes to be signed by classmates who meet the criteria stated in each square. They walk around asking others if they like chocolate chip cookies, for example, or if their parents have a red car. They are not allowed simply to shove the sheet in another student's face and say, "Here—sign one." They must approach a fellow student and ask a question pertaining to the sheet. After the sheet is completed, everyone sits down. I then go through each category and ask the students to raise their hands if the category pertains to them. They can look around and see what they have in common with others in the room. The sheets I first use include characteristics that are true of me. The students quickly see what we have in common. A few weeks later, after I've had the opportunity to read personal information about the students that I've asked them to share on index cards, I hand out sheets that feature characteristics or interests that I know students have. "A River Runs Through Us" is my all-time favorite relationship-buildingactivity for both the classroom and the staff room. Getting to know one another is as simple as forming a tight circle of chairs. You stand in the middle of the circle and begin by saying something like this: "Hello, my name is __________." The students are instructed to respond, "Hello, ________." Then you say something about yourself, adding "…and a river runs through us"; for example: "I have a dog, and a river runs through us." At this point, any child who has a dog must get up from his or her chair and move to another chair. Quickly, you take one of the empty chairs, leaving one student now in the middle of the circle. The process repeats as before. Try to make sure every child gets a chance to be in the middle. You may have to get back to the middle (which usually happens anyway) and say something that you know pertains to a student who has not had the opportunity to be in the center. By the time this activity concludes (usually about 20 minutes depending on the size of the class), everyone will know each other's names and find things in common with each other. At the end of the first time you do this (students will want to play this game again and again), you may want to say something like, "We all have so many things in common. I believe each and every one of you have similar experiences! A river really does run through us!" Attend after-school activities. Your presence at these events will make a difference to your students by showing that you care about them outside of class. Give students special responsibilities and leadership roles in class. Create a photo bulletin board. Hang up students' artwork. Most students like to see their artwork up, even if they say they don't. Use gestures and facial expressions to get points across. Employ humor. When I taught middle school grammar, two of my favorite phrases to start lessons about punctuation were "Let's eat Grandma" and "The things I love are cooking my family and my friends." Today, with the ubiquity of texting and social media, fewer and fewer people are using standard punctuation on a regular basis. Popular. This category often consists of students who are attractive, athletic, and affluent. These students, who often take the lead in deciding what's "in" or "out" among their peers, compose about 35 percent of the student population in the United States. The main emotional issue with this particular group is related to the impermanence of popularity; these kids may be worrying about how to maintain their prized social status. Fringe. Students in this category make up about 10 percent of the population. These students sometimes get to hang out with the popular kids and sometimes don't, rendering them insecure about whether they are popular themselves. Not knowing exactly where they belong is a prominent emotional issue for them. Friendship Circles. These are small groups of students who are good friends with one another. They realize they are not popular, but they are content with the companionship. This group makes up roughly 45 percent of the population. Loners. This category is composed of the 10 percent or so of kids who have few or no friends. Loners may be bright, ambitious, and years ahead of their peers, or they may have poor social skills and be difficult to be around. Although these students would possibly like to be a part of a group, they are often not accepted. Sometimes these kids may become bitter about their social situation and even lash out. Giannetti and Sagarese's research suggests that only 45 percent of our students feel confident in their social status at school. The all-too frequent school massacres perpetrated by socially ostracized students should remind us how important it is to be aware of school social structures and their effects on students' emotional stability. One good place to keep aware of things is the school cafeteria at lunchtime, where the dramas of social strata com-mingling play out as students figure out with whom to sit. To set up strong relationships, all of these students must be able to interact with one another and respect the differences among them. One day, I arrived at school right after the emotional ordeal of having my 9-year-old Sheltie put to sleep by the vet. When I stopped by the office to tell the administrators I was back, my eyes were red from crying. One of my colleagues expressed her sympathy and reminded me, "Don't let those kids see you cry!" I nodded. Walking despondently down the hall, I began to feel resentful of my coworker's comments. Couldn't I express my emotions? Wouldn't my students think I was heartless if I didn't seem upset? And wouldn't this be an excellent opportunity to teach empathy? When I arrived at the room, all eyes were on me. "You're here!" exclaimed one of the girls. "Are you sick?" asked another. "No," I replied. "I just had a very sad experience." I explained what happened. "My cat had to be put to sleep, Mrs. Sprenger," Nancy offered. "I felt really bad." "I'm sure you did," I acknowledged. "It's just a dumb animal," Brett announced. I looked at Brett, and the students looked at me. "Have you ever had a pet?" I asked. "Yeah, we got a dog. He sleeps in my room," Brett shared. The students began to dialogue about loss. Brett sat quietly until the conversation ended. He walked over to me on his way out the door. "I'm sorry, Mrs. S.," he said. "I guess I didn't really think about how it would feel. I'd be upset, just like you." The students learned two things that day. First, they were able to put themselves in my shoes and understand how I was feeling—what we call empathy. Second, they recognized my feelings and saw that I could manage them. According to Comer (2003), "Children need to form emotional bonds with their teachers and see healthy social relationships among the adults in their lives to function well in school" (p. 11). Mental Note: Attention and motivation can be directed through personal relationships with students. "Why Do I Have to Know This Stuff?" How many times have we heard this question? When we think about relevance, we can again look at the brain and how it learns and remembers. The brain takes new information and searches long-term memory to find patterns into which it might fit. If you look at Figure 1.5, your brain sees a square. Is it really there? No, but you have a pattern in your brain for squares, and this is what your brain finds to fill in the blanks. When we offer information to our students, their brains try making connections to already-stored patterns. If there are no connections, the information is easily dropped. Relevancy involves making some associations that affect their lives. This is not a simple task when we look at the standards and benchmarks that we must reach. Research shows that students perform better when they are provided with criteria, models, and examples that clearly illustrate our expectations (Schmoker, 1999). Student-centered classrooms can be created using both project-based learning and inquiry learning activities that focus on honing information-processing skills and lead to understanding. Reaching our students through relevant issues increases the chances that information will enter the memory process. Scenario 1: Miss Owen's students enter the classroom. They immediately take their seats and get out their notebooks. Today they are studying the Lewis and Clark expedition. They know this because Miss Owen has it written on the whiteboard. As soon as the bell rings, Miss Owen begins disseminating information via lecture. Some students frantically take notes. Others lose their focus quickly and gaze around the room. Miss Owen has some posters up depicting the events of the expedition. Perhaps some of her students will learn something from the posters. Scenario 2: Miss Owen's students enter the classroom. On the screen is a picture of a huge mosquito. Beneath the picture is written, "You are part of the Lewis and Clark expedition. One of the biggest nuisances you have are the mosquitoes. They are everywhere. There are times when it is difficult to breathe without inhaling a bug! Research ways to deal with this problem during your expedition. Compare your information with what we would do today." Posters, books, and internet access are available to the students, who are divided into groups. Miss Owen's students in the second scenario learned much more than how to handle mosquitoes. Approaching the lesson with a problem that all can relate to is an invitation to learn. Her students followed the entire expedition as they followed those insects. She also added relevancy by having her students create a Venn diagram comparing what Lewis and Clark took with them on this trip to what their own families would pack (Figure 1.6). Making content relevant to our students' lives allows them to start making connections to prior knowledge immediately. Problem-based learning is experiential learning that is built around a real-world problem. Students engage in the process of identifying the problem and then finding a solution. This is an open-ended approach to learning the standards. Problems should touch on issues that professionals in the field of study would tackle in the real world (Wiggins & McTighe, 2005). Many of our diverse learners have difficulty relating to our goals and standards. Students from extreme poverty may be focusing on survival. Reading with fluency, understanding different forms of government, and knowing and applying concepts that explain how living things function, adapt, and change may not be the most crucial things to them. Nevertheless, it is our job to help students reach those benchmarks. The most powerful thing we can do is to help them find the relationship between their lives and our goals. It's not an easy task. ELA.SL.K.1a. Participate in collaborative conversations with diverse partners about kindergarten topics and texts with peers and adults in small and larger groups. (a) Follow agreed-upon rules for discussions (e.g., listening to others and taking turns speaking about the topics and texts under discussion). (b) Continue a conversation through multiple exchanges. Mental Note: Our students remember what affects their lives. Teachers have their own ways of reaching students, and often instinctively they know when it's time to try something new. Novelty is appealing to the brain. Perhaps you remember how the reticular activating system filters information. When the brain perceives incoming information to be unusual, it releases norepinephrine to focus attention; once the novelty is gone, this is no longer the case (Ratey, 2008). Flooding the hippocampus with dopamine aids recall. To activate this "flashbulb memory" process, surprise students before or after introducing content you want them to remember. The retention of episodic memory is enhanced, in humans and animals, when something novel happens shortly before or after information is introduced (Takeuchi et al., 2016). Use a whistle or other sound your students are not accustomed to hearing. Play music pertaining to your content. Use a PowerPoint presentation with animation. Research has suggested for years that teachers "chunk" information into small, easily understood portions (Marzano, 2017). New information is more easily received and placed into working memory this way simply because of the limits of working memory. In this way, students can focus on a bit of the information and reflect upon it before adding more. We can do this by having students read a few paragraphs of text and then stop to think and talk about it, or simply by verbally disseminating information. Just don't give your 5th graders all seven reasons for the westward expansion or all five steps in the story problem—feed them the information bit by bit. Marzano (2017) suggests that we begin by using our pre-assessment data to plan our chunks of information. Creating a pre-assessment will provide you with information to help guide your entire unit. In fact, pre-assessment should be given at least a week before you are to begin a new unit. How well your students do will guide you as you prepare your lessons. It will also help you to differentiate your lessons, as you will probably have students who do well and others who need more help. If you pre-assess and all your students do well, you may be able to review some of the information in a larger chunk and add new material in smaller ones. Giving your post-assessment for the unit to see how well students do. Using a KWL or KWHLU chart (see Appendix B). Implementing the think-ink-pair-share strategy, which gives students the chance to write down what they know about the topic after a minute or two of thinking about it, then pairing up with another student and sharing ideas. Employing exit cards in the form of index cards handed out at the end of class and asking students either to free-write about what they know on a topic or supply the answer to a prompt (e.g., "Write three things you know about this topic, two things you might know, and one question you have"). We know through cognitive research that attention, motivation, relationships, relevance, learning preferences, and emotions are essential components of the "reaching" process. If we can get information from sensory memory into immediate memory, then we are on our way to long-term retention. As people mentally prepare for a task, they activate the prefrontal cortex, the area that performs higher-level functions and puts them in action. This advance preparation ensures that they will perform better than without prior activation (Kolb & Whishaw, 2009). Be aware of possible distractions in your classroom. For instance, auditory learners may be sensitive to sounds. If you can't have that noisy radiator fixed, try to seat the sound-sensitive student as far from the distraction as possible. Think about extrinsic motivators that you may be using now. Some may be appropriate and necessary, but are others possibly undermining your students' innate desire to learn? Discuss with colleagues ways to make your content more meaningful to your students. How can you explain the necessity of the content? Can you make it more desirable? Can you create interdisciplinary units that would be more relevant to your students? Examine the climate of your classroom. Are you meeting the needs of your students? Are they comfortable with you and their peers? Could you change anything to make things better?